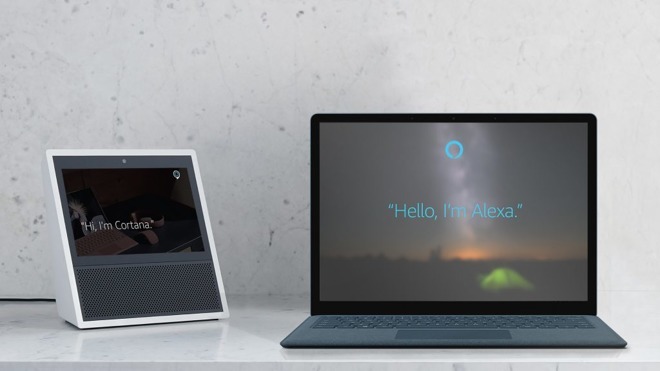 Starting "later this year," people will be able to access Alexa via Cortana on Windows 10 PCs, Microsoft said on Wednesday. Cortana, meanwhile, will be accessible from Alexa devices like Amazon's Echo speakers. People will have to ask the primary assistant to "open" the other one. Android and iOS support will follow sometime after the Windows 10 deployment. That will likely include the Cortana iOS app, but not the Alexa app, which is strictly a companion for other devices. Neither voice assistant will be accessible outside apps on iOS, since Apple has so far restricted that functionality to Siri. It's also unlikely that Apple will enable support for other assistants through Siri, since that would break with the company's typical "walled garden" approach to its ecosystem. Both Amazon and Microsoft have been eager to get their AI on third-party devices, presumably to draw people back into their own products and services. Indeed Google today announced that several third-party speakers will be getting Google Assistant, namely the Anker Zolo Mojo, Mobvoi TicHome Mini, and Panasonic GA10. Apple will expand the number of Siri-compatible devices later this year with the HomePod, shipping in December for $349.